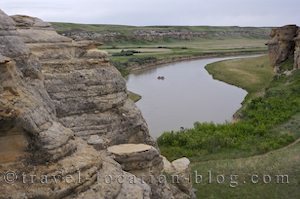 A journey through the diverse landscape of Alberta, from its lakes and mountains of Waterton Lakes NP, varying shapes and sizes of hoodoos at Writing on Stone Provincial Park to its vast plains. in Writing on Stone Provincial Park, Alberta, Canada. Well we're on our way! Today's entry covers a few weeks of travelling since we pretty much made a mad dash across the country. On May 14, 2007 we left the pretty area of Saanichton in Victoria and headed to the BC Ferries terminal in Swartz Bay to catch the 8am ferry to Tsawwassen in Vancouver. This time we had a reservation because we really, really didn't want to miss this ferry and quite often we've turned up to find that there's a 1 or 2 ferry wait. So, the one time we make a reservation the ferry is only half full. Oh well, at least we're on our way. After running a few erands in Vancouver, we finally head out of town towards Calgary where we have a few more errands to run before heading east. The first night, we made it as far as Revelstoke in BC but it was debatable if we'd actually make it through Glacier National Park the next day since there was a severe slip along the Trans Canada Highway and the road was completely blocked. There are several other routes available, so it's unfortunate that they couldn't tell us that a lot earlier before we came this route. That's tomorrow's worry, we pulled into the Lamplighter Campground and took a nice site near the facilities and got a good night sleep - first night in the camper!! So ends our first day on the road. The next day we heard the radio announcement about the road and decided to see how far we'd get - the road was to open briefly for traffic, so we'd better be there for when it opens. When we arrived luckily we only waited for about 15-20 minutes before being let through. We couldn't believe what the big deal was - it was basically just a muddy road! We continued on to Calgary and booked in for our various appointments the next day. That night and the following night we stayed at Calgary West Campground. By May 17 we were on the road again heading south out of Calgary. We'd decided to spend a few days here to "regroup" and rearrange the camper a little. We made it as far as the end of Highway 2 near Fort McLeod - just before the junction with highway 3. We pulled in to a basic provincial camp site along the main road. The next day we headed straight for Waterton Lakes National Park where we camped at Crandell Campground for 2 nights, then a third night in Writing on Stone Provincial Park. Then it was time to really hit the road. We travelled long and hard for the next 5 days until we reached Ontario where we had another appointment which kept us there for 2 full days. Finally we hit the road again and made it to North Sydney in Nova Scotia by May 30, 2007 after travelling over 7000 kms. We pulled into the ferry terminal and got into line for the ferry the next morning. It was an extremely tiring trip. Canada is quite a large chunk of land and until you do a trip like this you don't really appreciate just how big it actually is - it's huge!! The Marine Atlantic ferry terminal is very busy and therefore very noisy, unfortunately we didn't manage a lot of sleep while parked there. There are trucks, fork lifts and who knows what zipping about the terminal - with bright flashing lights and beepers ringing out all night!! Luckily, we are almost there!! Newfoundland is a 5-6 hour ferry trip away and we can hardly wait!! Press "Ctrl+D" to bookmark this page. Copyright © 2000 - 2010 www.travel-location-blog.com. Unauthorized use of any images or footage from this site is prohibited by international copyright laws.